After a few months of hibernation, our puppets have returned! You can now check them out, along with some new puppets bought for you by the Friends of the Library. Looking for a particular puppet? Find it on this list and click on the icon to the left of the name to request that specific puppet. Puppets are a great tool for helping your child develop narrative skills, that is creating stories with a beginning, middle and end. Extreme Science Great multimedia source for everything science...just for kids! Books are a great way to introduce kids to the people of the world, with all their similarities and differences. Use these titles as a way to start a conversation in your house about life around the world. A Cool Drink of Water by Barbara Kerley. Water is everywhere. See how people gather and enjoy water around the world. Fantastic vibrant pictures and simple text tell the story. Talk about the different ways your family uses water throughout the day. One World, One Day by Barbara Kerley. Kids around the world wake up, go to school, do chores and enjoy family time. What does your family's day entail? Our Grandparents: A Global Album by Maya Ajmera, Sheila Kinkade and Cynthia Pon. Families are important no matter where you live. What special things do you enjoy doing with your grandparents? What the World Eats by Peter Menzel. Everybody goes grocery shopping. See what a week's worth of groceries looks like to 25 families from 21 countries. What items from your list can you find in the pictures? We'll be on story time break March 22-26. Have no fear...there will be toys and games in the Puett Room for those who would like to visit and socialize. Other programs will be going on as well, so be sure to stop by! Saturdays, March 20 & 27 from 2-3 p.m. -- Oregon Symphony Story Times -- Catch the last two musical story times in the Community Room. 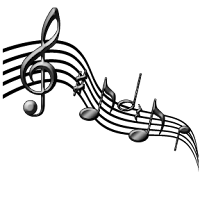 Enjoy music, books and a chance to visit with a musician from the symphony. Tuesday, March 23 from 3-5 p.m. -- All Ages Animanga -- Watch the newest animated film from director Miyazaki about a young boy who rescues a goldfish who wants to become human. Also enjoy coloring sheets, Japanese treats and Wii games. 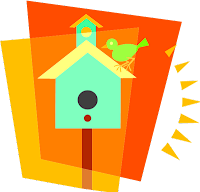 Sunday, March 28 from 1:30-2:30 p.m. -- Make a Birdhouse -- Kids 5 & up are invited to create their own birdhouse out of a recycled materials. This month's book club read was Blue Balliett's Chasing Vermeer, an art mystery with plenty of intrigue. Three mysterious letters are delivered to three different people. Each person is asked to help correct on of the greatest mistakes in art history. At the same time on of Vermeer's paintings disappears from the museum and the thief claims to be righting a wrong. What is art? Is a crime ever justified? Can a boy and a girl join forces to solve a mystery? One of my favorite aspects of this book is the code based on pentominoes, or differently shaped blocks. The illustrator took this as a challenge and worked a code into the illustrations. So in addition to a fast paced adventure, the pictures add another level of involvement to the story. I recommend this book for readers that like a challenge and have a good appreciation of art. Other great mysteries with a hint of art: Blue Balliett's other titles in the series, Shakespeare's Secret by Elise Broach and Framed by Frank Cottrell Boyce. Five teens wrote, acted, filmed and edited this film during a recent program. For more information about programs the library offers for teens, check out our webpage. Group Boredom from Tigard Library on Vimeo. I am very excited to get to combine two of my favorite things, books and music, and bring to you Oregon Symphony's Symphony Storytime. Terri and I will be doing story times each Saturday in March from 2:00 to 3:00 in the Community Room along with a musician from the Oregon Symphony. Kids will get to enjoy stories along with violin, bassoon, French horn, and percussion, respectively. After hearing stories, they will get to experience an instrument "petting zoo" and make a fun musical craft. This will be fun for the whole family, and books will be chosen with the wee ones in mind (ages 6 and und er).